This post was part of a longer post: Louis Riel, Hero or Rebel. It is also related to posts one can find under The Voyageurs Posts, Aboriginals in North America and the two Canadiana posts: Canadiana.1 and Canadiana.2. These are pages. It is also associated to The Red River Settlement, a post. Yet, somehow, it is new. Therefore, the HBC built trading posts inland and started to use riverways and employ voyageurs. Wikipedia has a complete list of HBC trading posts. Riverways were the highways of the day, which I noted in an earlier post, hence the lots of the Red River Colony being narrow and deep. Inhabitants had their boat, a canoe, “at the ready” at the river end of their lot. Swiss-born Artist Peter Ridinsbacher left a visual testimonial of this juxtaposition of lots. In the images above, one can see the canoes at the river end of narrow lots and adjoining houses. The ice was also used in winter. Peter Rindisbacher lived in the Red River Settlement at the time the fur companies, Hudson’s Bay Company and North West Company were merged, in 1821. This story has a happy beginning, despite glitches and the disastrous Battle of Seven Oaks. The Earl of Selkirk, a philanthropist, set about finding land for the Scottish crofters who had lost their home. Many settled in Nova Scotia, i. e. New Scotland. My neighbours, Dr Cecil MacLean, professor of French at St. Francis Xavier, and the Honourable Allan J. MacEachen, one of the finest politicians in the history of Canada, were both descendants of crofters. Mr MacEachen spoke Gaelic. The video inserted at the bottom of this post tells the story of crofters Lord Selkirk helped relocate to the Red River Colony. The crofters would live in the Canadian great plains which was fine territory for farmers. They were excellent recruits. In order to acquire the land he needed to found the Red River Colony, the Earl of Selkirk and his family bought a large number of shares in the Hudson’s Bay Company (HBC). In fact, the Earl of Selkirk became the majority shareholder. The fur trade was drawing to a close for want of beavers, which meant a complete change of lifestyle for voyageurs. Retired voyageurs, such as Louis Riel’s grandparents, Jean-Baptiste Lagimonière or Lagimodière and Marie-Anne Gaboury, settled in the future Winnipeg, However, many young voyageurs did not prove suited to farming. So, as the fur trade declined, they became guides to explorers in search of the Northwest Passage and a way to the Pacific Ocean, north of the South Pass (Wyoming). Truth be told, voyageurs and Amerindians opened up the continent, but as employees rather than employers. They were employed by explorers. In July 1811 Miles Macdonell sailed from Yarmouth, England to the Hudson’s Bay post at York Factory with 36 primarily Irish and Scottish settlers. Due to persuasive efforts of the North West Company only 18 settlers actually arrived at Red River in August 1812. 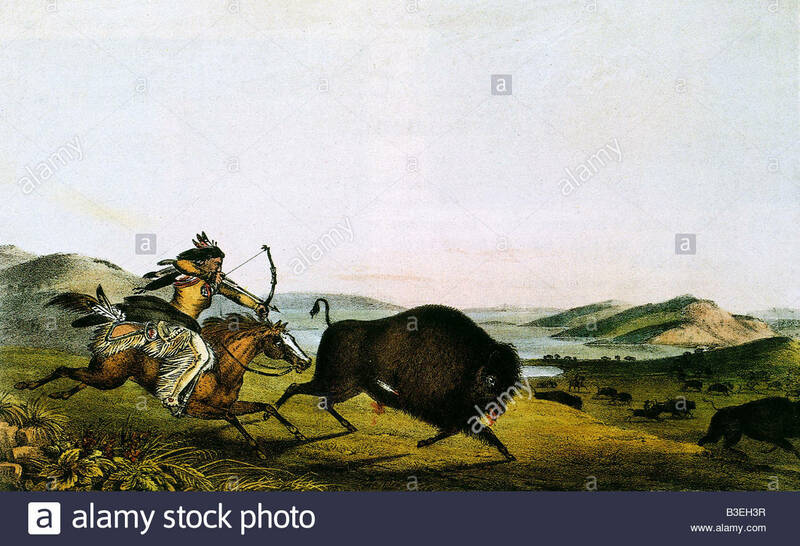 As the planting season had ended before the settlers could complete the construction of Fort Douglas, they were forced to hunt bison for food and were completely unprepared for the arrival of 120 additional settlers in October. In short, although crofters —farmers, were excellent recruits to the great plains, they had to face hunger. They needed pemmican from the nearly extinct “buffalo.” Pemmican was the food of the fur trade and it would also be the food of explorers. Amerindians and Métis prepared pemmican for voyageurs. Voyageurs were customers. However, newcomers faced not only hunger, but also the coldest and harshest winters in Canada, south of the Arctic. I lived in Regina, Saskatchewan, for a year and loved it, but it was cold. However, the worst our new Canadians had to cope with, other than memories of a lost land, were warring factions: the Hudson’s Bay Company (HBC), chartered in May 1670 (at first, a fur-trading company), and its rival, the North West Company (NWC), founded in 1789 and headquartered in Montreal. In the first edition of this post, I failed to note that, in 1816, several disbanded members of the Régiment de Meuron, or Meurons, “a regiment of infantry originally raised in Switzerland in 1781” and commanded by Charles-Daniel de Meuron, mercenaries (i.e. professional soldiers), chose to settle in the Red Riv er Colony. (See Régiment de Meuron, Wikipedia). They had seen action in India, as a British Infantry, in Canada, under Sir James Charles Prévost, at the Battle of Plattsburgh, during the War of 1812, and in the Red River Colony, as discharged soldiers in the Pemmican War.” In 1816, when the regiment was disbanded, half of De Meurons‘ 640-men strong infantry settled in Canada and many chose to live in the Red River Colony. So did members of the disbanded De Watteville’s Regiment. Later, some of its [Régiment de Meuron] soldiers also served at the Red River Colony. Some 150 recently discharged soldiers from the Régiment de Meuron and De Watteville’s Regiment, still retaining their uniforms, participated in the Pemmican War. Rue des Meurons in the Winnipeg suburb of Saint Boniface is named after the regiment. Among recruits to the Red River Colony was the family of Swiss artist Peter Ridinsbacher, whose lovely watercolours depicting Aboriginals, Métis, and the Red River Colony are a precious legacy. The Ridinsbachers lived in Assiniboina or the Red River Colony. Their home was flooded in 1826, which was calamitous. Peter’s family decided to leave Assiniboina, or the Red River Colony, for the United States. (See 1826 Red River Flood, Wikipedia). They therefore moved to Wisconsin, but ended up settling in St. Louis, Missouri, where Peter died, “possibly of cholera,” (Wikipedia) at the age of 28. Another inhabitant of Assiniboina was Swiss musician Edward Ermatinger, a Hudson’s Bay Company employee who ended up settling in St. Thomas, Ontario. His collection of the words and music of French Canadian folksongs, the voyageurs répertoire, as well as a “Red River March” he composed, may be the only connection to have come down to us. Our fur trading companies competed not only for the best and the most pelts, but they also needed pemmican. On 8 January 1814, fearing famine, Miles Macdonell, who was appointed first governor of Assiniboia, the Red River Colony, in 1811, issued the Pemmican Proclamation. The Pemmican Proclamation forbade the exportation of food from the Red River Colony (HBC territory), which angered both the Métis and employees of the North West Company. They believed it was a ploy on the part of the Hudson’s Bay Company. Six months later, Miles Macdonnell also issued a proclamation banning the “running” of buffalo with horses. Hostilities culminated in the Battle of Seven Oaks (The Canadian Encyclopedia). A group of Métis had retrieved pemmican from the Hudson’s Bay Company, claiming it had been stolen. The canoes came down the Assiniboine escorted by Cuthbert Grant, an Anglo-Métis, who was the son of Cuthbert Grant père, a Nor’Wester from Scotland, and a Métis mother. Young Cuthbert was educated in Scotland. The animal that roamed the great plains was often called a buffalo, which was a misnomer i.e. the wrong name. To tell the difference between the bison and the buffalo, Britannica suggests focusing on the three H’s: “home, hump, and horns.” Bison have a hump and their horns are shorter. Bison, not buffaloes, therefore lived in the great plains of North America. Interestingly, French Canadians call(ed) the buffalo a bison, which happens to be the correct name. For a very long time, I thought bison was the French translation of buffalo. It isn’t. The buffalo is un buffle in French and bison is both a French and an English word. Bison does not have a plural in English. The Royal Proclamation of 1763 empowered Amerindians and Métis. We do not know whether or not Métis residents of the Red River took the Pemmican Proclamation seriously. But it could be they didn’t. As I suggested in Louis Riel, Hero or Rebel, it is altogether possible Louis Riel looked upon his government as genuine and the execution of Thomas Scott as legitimate. But he was blamed. He could not take his seat in the House of Commons and he hid for fifteen years. Rupert’s Land belonged to North-American Indians, but colonists felt entitled to land that did not belong to them but which they claimed and then sold. John A. Macdonald’s government bought Rupert’s Land. As for the settlers who left the Red River after the The Battle of Seven Oaks, they made the right decision, but thousands of United Empire Loyalists, those who would not live in an independent United States, took refuge in the British colony immediately north of the fledgling United States. Despite difficult beginnings, The Red River Settlement would be a permanent settlement. We have a Winnipeg and a Saint Boniface. In the late 1860s, when Canada or William MacDougall and surveyors entered their community, the varied inhabitants of the future Winnipeg lived peacably. The Earl of Selkirk died in 1820. His death allowed a merger of the Hudson’s Bay Company and the North West Company (1821), and ended a merciless conflict. Transcribing the Coltman Report – Crowdsourcing at Library and Archives Canada, posted on November 29, 2016 byBeth Greenhorn.